The immense contribution represented by this study has been acknowledged since its first publication in 1982. This reprint edition once again makes Tigay's groundbreaking work readily available to humanists, historians of literature and religion, biblical and classical scholars, anthropologists, and folklorists. [Tigay’s] book will prove a most useful and most important tool for further scholarly advance. I can warmly recommend its publication. This important book, [is] rich in detail and elaborate in presentation... scholars of literature, of the history of religions, of biblical studies, or, for that matter, devotees of Gilgamesh and his legends will find the book rewarding. I think that this is a first-class piece of scholarship… [Tigay] has given us the first comprehensive analysis of the post-Sumerian Gilgamesh material, has examined in detail the interrelationships within this material, and has presented a strong case for a certain line of development. This book is essential for all who would study the Gilgamesh Epic. Full bibliography completes this excellently produced book…. 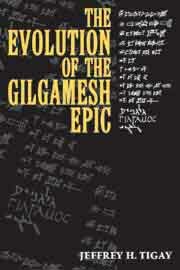 This is an important book for understanding the Gilgamesh epic itself. Jeffrey Tigay’s exposition is an exhaustive treatise whose method and meticulous scholarly approach is founded upon textual evaluations rather than hypothetical literary criticisms. There is no doubt that the reading and study of this carefully prepared work is to be recommended not only to Assyriologists and biblical scholars, but to all those who are seriously interested in the culture of the ancient Near East, in the history of literature and religion, or simply in one of the most outstanding expressions of humanism. This study of evolution tracing its development through all of its known stages over a period of at least 1500 years down to the manuscripts of its final version. The methodology employed by author differs from that developed for the stud of ancient literature in the 17th century through early 20th centuries primarily in that it is based on documentation from the early stage of the epic. The Epic of Gilgamesh is one of the most significant Mesopotamian compositions discovered and reconstructed in the century and a half since the libraries of ancient Nineveh were first excavated. The Epic recounts the deeds and struggles of Gilgamesh, a king of the city-state Uruk in the Sumer. It is an ideal specimen of a study. No other Mesopotamian epic is so well attested from so many different periods. It is an exhaustive treatise and scholary approach upon textual evaluations rather than hypothetical literary criticism. The Epic of Gilgamesh is one of the world's oldest known epics-it predates Homer by several centuries and is recognized as seminal to the cultural history of the Ancient Near East. Interpretation and decipherment of the story of Gilgamesh-fragmentary and contradictory as its several variants are-has been a monumental scholarly task, spanning more than a century…until Jeffrey Tigay teased out the epic's evolution. In this volume, Tigay traces the development of the composition of The Gilgamesh Epic over nearly two millennia and through the several languages in which it has been transmitted. The result is a study both comprehensive in breadth and impressive in methodology. The author breaks from his scholarly predecessors in relying on documented textual evidence rather than on critical analysis and hypotheses. The immense contribution represented by this study has been acknowledged since its first publication in 1982. This reprint edition once again makes Tigay's groundbreaking work readily available to humanists, historians of literature and religion, biblical and classical scholars, anthropologists, and folklorists. Jeffrey H. Tigay is the Abraham M. Ellis Professor of Hebrew and Semitic Languages and Literatures in the Department of Asian and Middle Eastern Studies at the University of Pennsylvania.